A PDF version of this article appears in the June 24, 2016 issue of Executive Intelligence Review and is re-published here with permission. 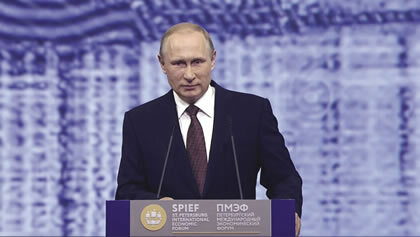 Russian President Vladimir Putin addressing the plenary session of the St. Petersburg International Econoomic Forum, June 17, 2016. As early as June we, along with our Chinese colleagues, are planning to start official talks on the formation of comprehensive trade and economic partnership in Eurasia with the participation of the European Union states and China. I expect that this will become one of the first steps toward the formation of a major Eurasian partnership. We will certainly resume the discussion of this major project at the Eastern Economic Forum in Vladivostok in early September. Colleagues, I would like to take this opportunity to invite all of you to take part in it. Friends, the project I have just mentioned—the greater Eurasia project—is, of course, open for Europe, and I am convinced that such cooperation may be mutually beneficial. Despite all of the well known problems in our relations, the European Union remains Russia’s key trade and economic partner. It is our next-door neighbor, and we are not indifferent to what is happening in the lives of our neighbors, European countries and the European economy. Look at the immediate sequels to the SPIEF. On June 23-24, Putin will join China’s President Xi Jinping and Indian Prime Minister Narendra Modi at the Heads of State Summit of the Shanghai Cooperation Organization (SCO) in Tashkent, Uzbekistan. The current full members of SCO are China, Kazakstan, Kyrgyzstan, Russia, Tajikistan, and Uzbekistan, but both India and Pakistan are expected to be brought in as full members at this summit. Nor is that the end of it. “Iran is the next,” said Uzbekistan President Nursultan Nazarbayev from St. Petersburg. “So, this organization with three billion residents is becoming a huge power,” he added, according to PressTV.ir June 18, citing Interfax. 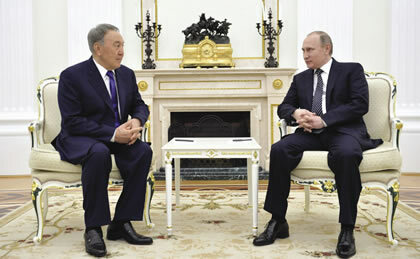 Russian President Vladimir Putin (right) with Kazakstan President Nursultan Nazarbayev, May 8, 2016. At the St. Petersburg Forum, Nazarbayev said that the Shanghai Cooperation Organization, meeting June 23-24, is becoming a huge power. Xi and Putin will leave from that Tashkent meeting for a bilateral summit in China on June 25. Among the 30 agreements being prepared for their signature there, there is an emphasis on cooperation in space technology, as well as on great cross-border transportation projects and energy. Russian Deputy Prime Minister Dmitry Rogozin, in charge of the Russian military-industrial and space complex, has been in China preparing the agreements on space exploration and defense. A little further ahead, Japan’s Prime Minister Shinzo Abe will attend the September meeting in Vladivostok mentioned by Putin as quoted above. There, not only is Japan to deepen its involvement in the economic level of the “greater Eurasia project,” but it is actually possible that Putin and Abe will sign an agreement in Vladivostok which will settle the territorial disputes between Russia and Japan which have prevented the signing of a peace treaty between the two nations ever since the fighting stopped at the end of World War II. The plenary session of the St. Petersburg International Economic Forum. Now the SPIEF occurred just as NATO, under Obama’s orders, is preparing for imminent military aggression against Russia,— even if few have the courage to call it what it is. NATO is holding highly provocative military exercises all along Russia’s western borders, assembling the biggest troop concentrations there since Hitler’s preparations for his June 22, 1941 invasion,— exactly 75 years ago. A NATO summit of heads of government in early July is to jack up the provocations further. Will a war of annihilation be prevented? No one really knows yet. But some have screwed up their courage. Germany’s Foreign Minister Frank-Walter Steinmeier told Germany’s mass-circulation Bild am Sonntag on June 19, “What we should not do now is inflame the situation further through saber-rattling and war cries. Whoever believes that a symbolic tank parade on the alliance’s eastern border will bring security, is mistaken. We are well-advised not to create pretexts to renew an old confrontation.” It would be “fatal to now narrow the focus to the military, and seek a remedy solely through a policy of deterrence.” And just today, German Vice-Chancellor Sigmar Gabriel, from the same Social Democratic Party as Steinmeier, let it be known that he will travel to Moscow next Monday, June 27, to meet with Putin. 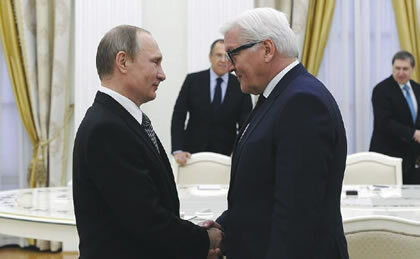 President Vladimir Putin (left) shown meeting at the Kremlin with German Foreign Minister Frank-Walter Steinmeier, March 23, 2016. As for the SPIEF sessions themselves, Europe was heavily represented, despite the sanctions. Italian Prime Minister Matteo Renzi met with Putin, and brought a very high-level business delegation, which is reported to have signed $1.4 billion in agreements with Russian companies. EU Commission President Jean-Claude Juncker was there, as was former French President Sarkozy and UN Secretary-General Ban Ki-moon. Six leaders of big German firms spoke in a panel on German-Russian cooperation, along with EU Commissioner Günther Oettinger; Germany’s top Russia expert, Alexander Rahr, was featured on another panel. A panel on Russian-Swiss cooperation included top corporate officials and an official of the Swiss Foreign Ministry; this occurred just as the Swiss government moved to withdraw the nation’s 1992 application to join the EU, after a vote to that effect by both houses of the Swiss Parliament. The final panel was on “Russia-Bangladesh: An Era of New Opportunities.” After the closing bell, there was a full-day conference on the development of the Arctic. Forum organizer and Putin adviser Anton Kobyakov said that attendance had been about 12,000, and that 1,300 companies had been represented. The principal U.S. representative in St. Petersburg was the Chairman and CEO of ExxonMobil, Rex Tillerson. The vibrant exchange with South and Central America in St. Petersburg has been ignored in most U.S. and European accounts. 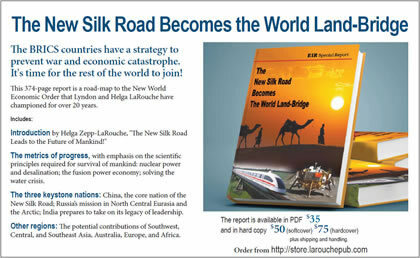 In a June 16 interview with Sputnik, Ecuador’s Minister of Knowledge and Human Talent, Andres Arauz, urged Ibero-American participants in the SPIEF to pay close attention to how China’s New Silk Road, the BRICS Bank, and other new financial institutions are embarking on great projects to “change the history of civilization.” South America must do the same, he said. Arauz is one of hundreds of government ministers and other officials from South and Central America and the Caribbean who attended the SPIEF, seeking greater economic and trade cooperation—as well as scientific and technological agreements—with Russia, China, and the nations of Asia, Africa, and Europe. The United States, under Barack Obama, offers them nothing except “green” technology, austerity, and depopulation. There was more. On June 15, the day before SPIEF formally opened, it hosted a full-day panel on Latin American integration, including panels titled, “CARICOM and the Caribbean,” “CAN—Andean Community,” “SIECA—Central American Secretariat for Economic Integration,” and “MERCOSUR,” along with panels of Russian business and government representatives.
. The program for the SPIEF is here.
. The rationale and program of the June 15 “Latin America Interregional Forum, Trade and Investment” is here. Seminar: Schiller Institute in San Francisco, California, June 8, 2016: "Will the U.S. Join the New Silk Road? Global Scientific Development or Nuclear War."